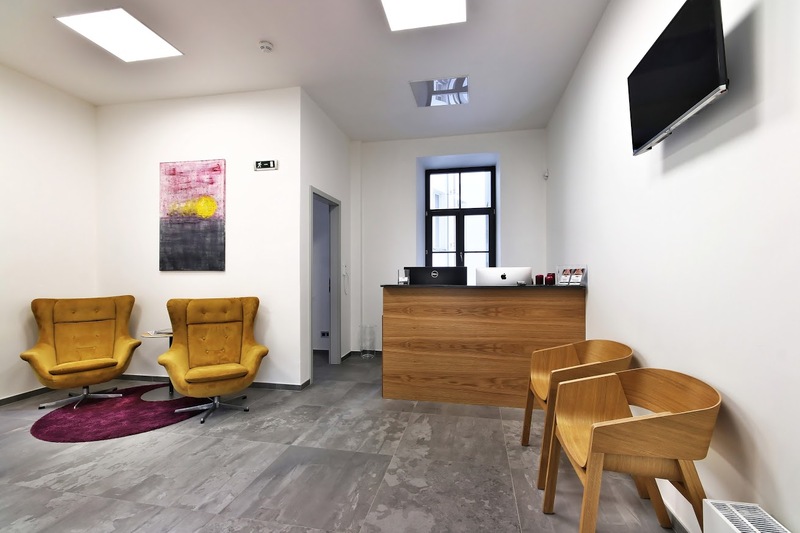 Our family dental clinic was created with the aim to provide our patientswith modern care according to European standards in a pleasant and casual environment. 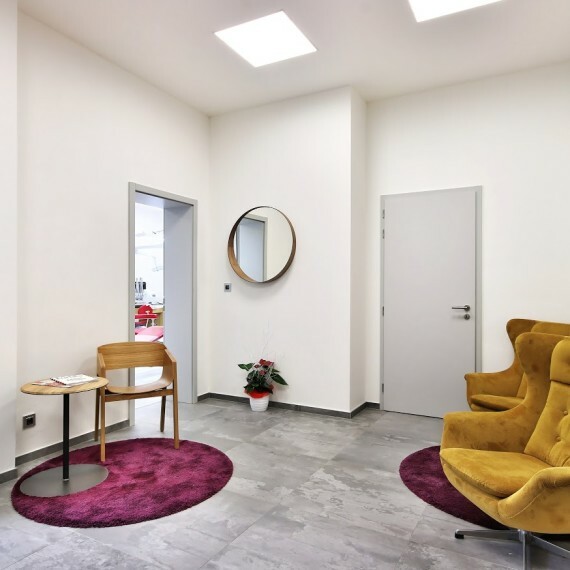 We put emphasis not only on ourwork, which is done to perfection, but also on theenvironment where we would like our patients tofeel comfortable, at home or justlike on a friend‘s visit. 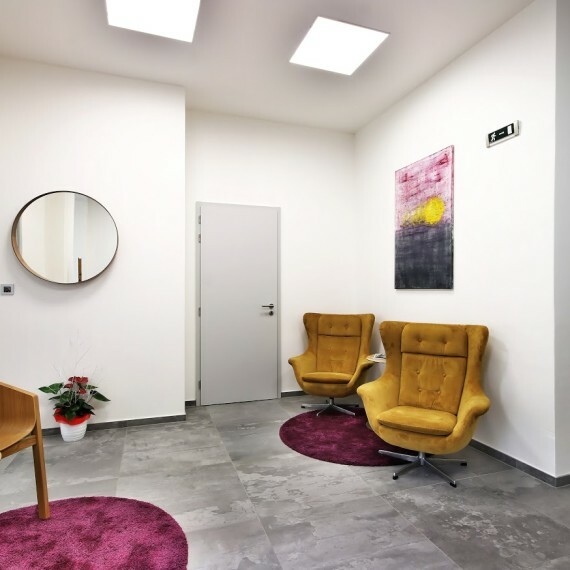 During the stomatological intervention, you can watch your favorite programme on television or your dentist can inform you about the ongoing intervention. Our television, which is above the dental chair, is highly appreciated by children. We are more than happy to let them watch their favorite cartoonto calm and distract them. 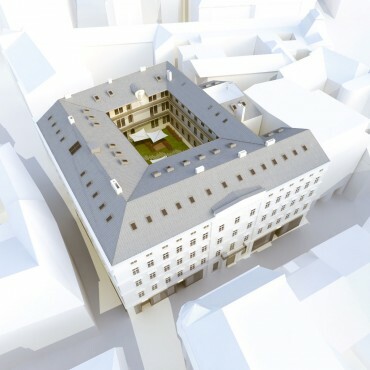 Palác Chlumeckých is a newly reconstructed building in Brno city center, between Česká street and Náměstí Svobody. On the ground floor, you can find a pharmacy and shops. 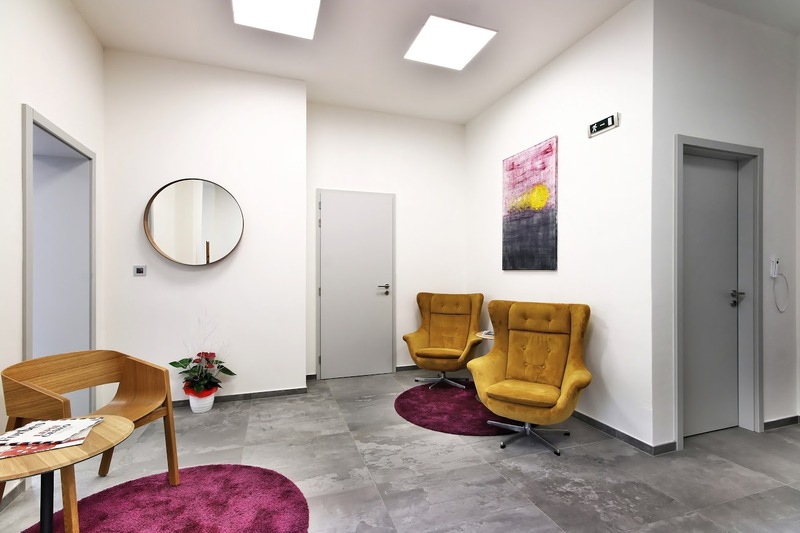 A well-known plastic surgery PERFECT CLINIC is located on the 3rd floor facing the garden – MUDr. Kufa, MUDr. 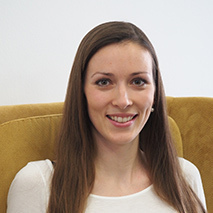 Pros and many others; orthodontics of a very experienced dentist – MUDr. 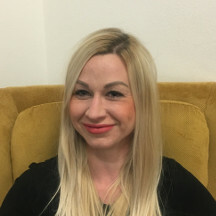 Pavlína Černochová PhD. 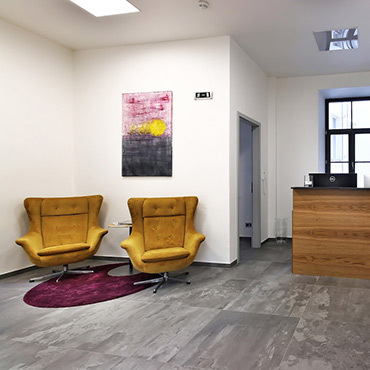 On this floor, you can also find our dental clinic which belongs to MDDr. 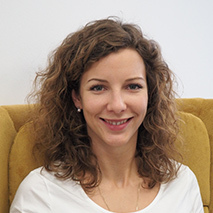 Jana Beranovská. 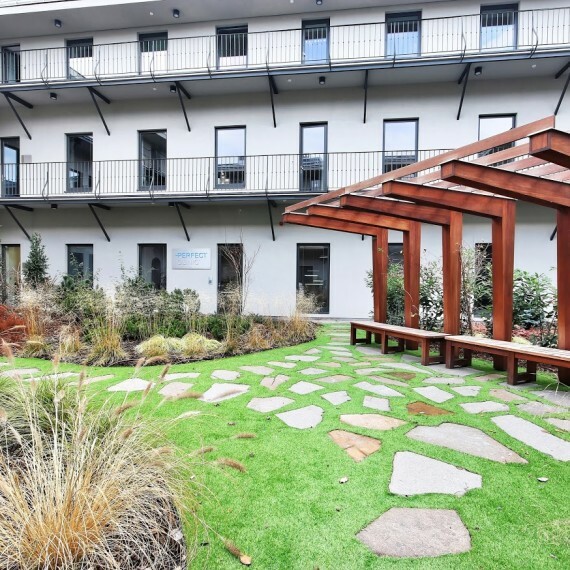 Our patients can relax at our reception not only over a cup of coffee but also in the garden directly in the city center. 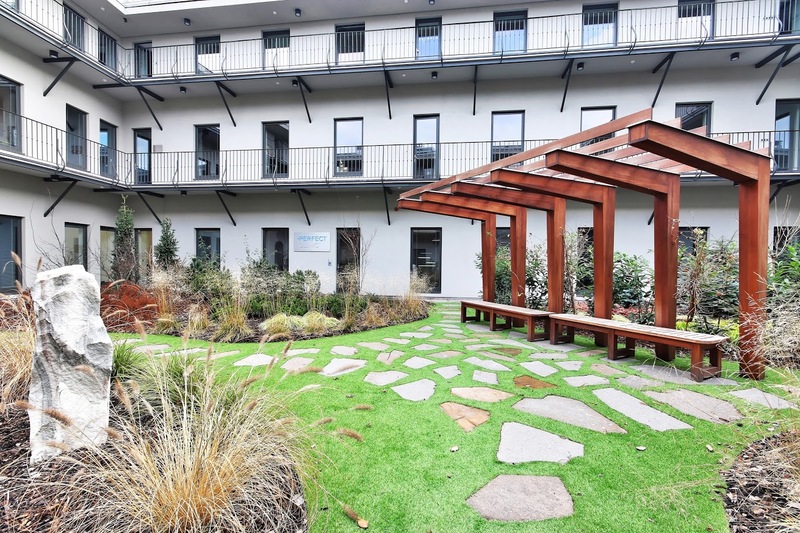 This place offers space for relaxation away from the busy streets of Brno. 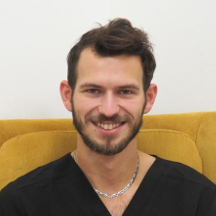 To restore our patients‘ health through healthy teeth and gums and also esthetic means – modelling of new shapes of teeth, creating a beautiful smile and making a man’s life to be of more value. 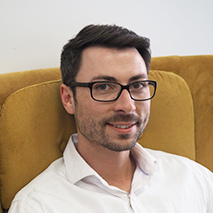 My watchword in business is to be fair and offer services and products with added value together with maximal care for our clients. 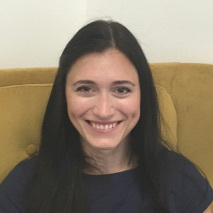 To my patients I want to give the best care by most modern procedures, sensitive human approach, care without pain and last but not least quality and estetic result. Because beautiful smile is the nicest thing we can wear. On dentist, pharmacy I enjoy working with pupils, creativity, variety, non stereotype performance and last but not least that peoples can see the result of our job. 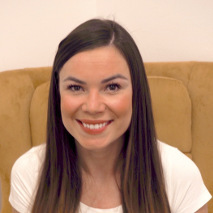 Everything is better with a smile and that’s also the reason why I chose SMILE FACTORY. 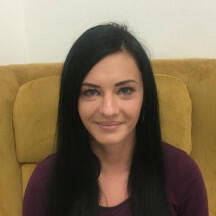 I am glad to be a part of the team that makes your smile more beautiful. It is everyone’s duty to take care of the health of his oral cavity and teeth. 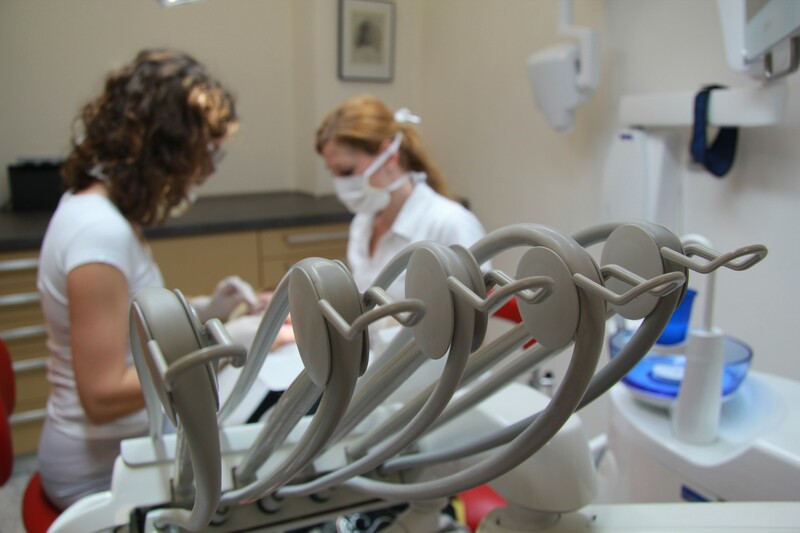 The duty of the dentist is to offer a perfect treatment tailored to the patients. Your wish and your demand are my priority. Renew and keeping the health, function and aesthetics are our goal. 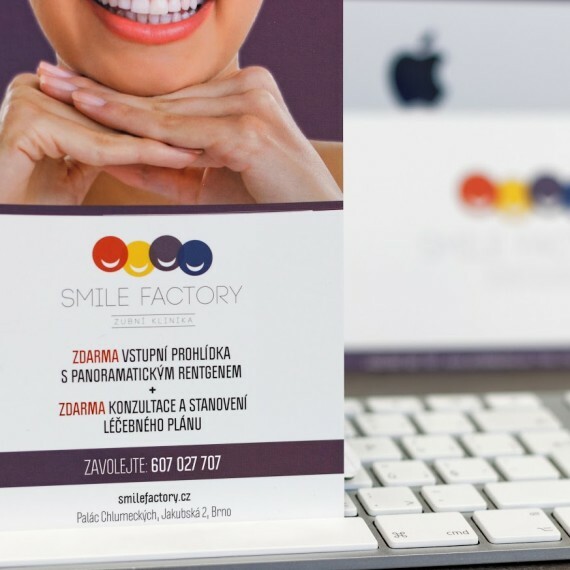 As a dental surgeon cooperating with SMILE FACTORY and besides it works at a dental surgery at FNUSA Brno hospital, I am trying to provide my patients with painless treatments, quickly and carefully. I am from podhůří Jeseníků, where peoples are not able to get that comfort, like here. 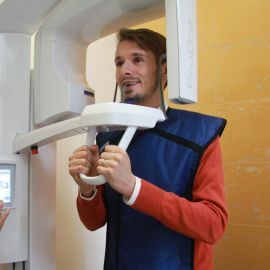 On reception I connect with patients first contact and therefore I can tell, that: ,,not dresses, but teeth make the man''. It is amazing to be part of them, which is helping people to hold health and beauty. My priority is perfectly treated and motivated patient, who knows, what is best for his teeth and gums. While looking at man's is firstly their smile, what i look at. I like to help peoples maintain oral cavity healthy and without problems, for them to give smiles and don't stress. While I am studying electronics, I support girls with things that need to be done around the clinic so that they can make the best out of their job. I took care of health and healthy lifestyle from when I was young. I was aware of the importance of quality dentists or surgeries in my youth, when I myself looked for the care of proffesionals, to help me. 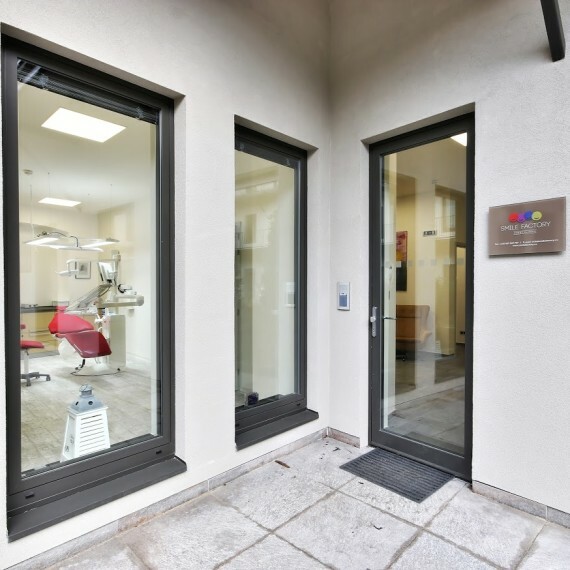 At the first visit – entry check-up – a thorough anamnesis (history) will be done, complex teeth analysis and oral cavity. 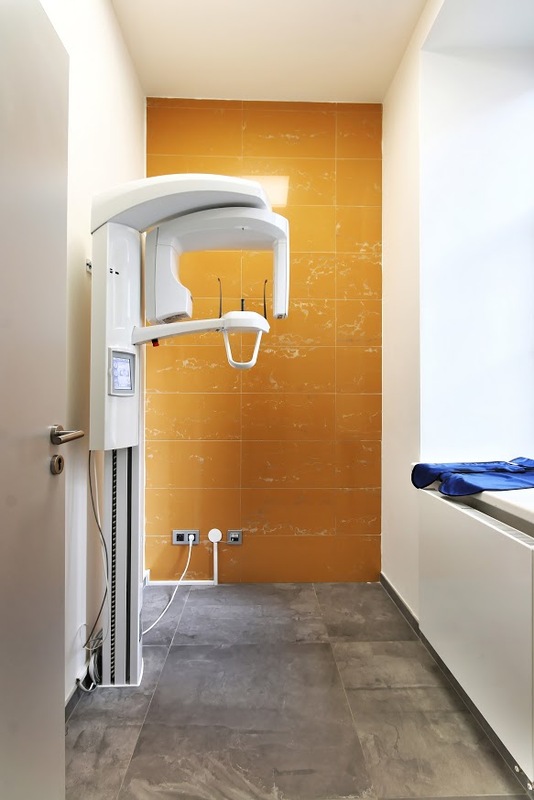 Our dentists suggest treatment plans based on the panoramatic X-ray (OPG) and examination of an oral cavity. 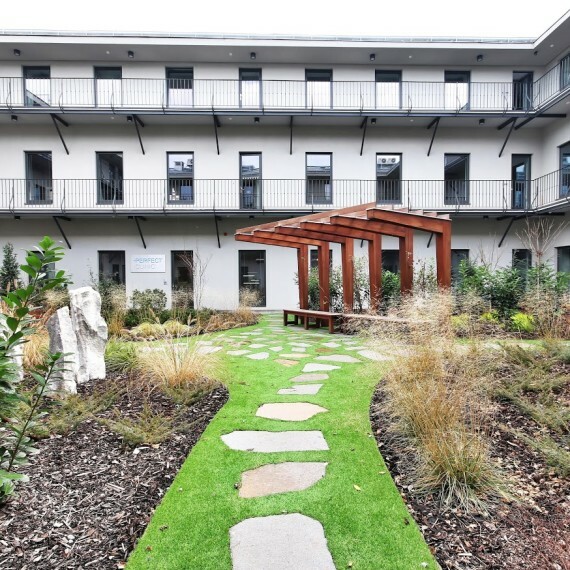 These plans are consulted with patients and their needs are taken into consideration. 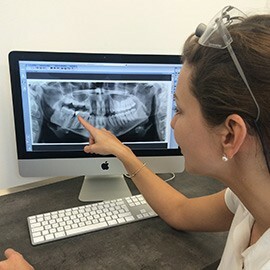 Panoramatic X-ray (OPG) provides our doctors detailed summary of not only tooth decays but also of cysts, tumours, fractures and other potential abnormalities. Based on the panoramatic X-ray OPG and complex check-up, a suitable treatment plan will be suggested. 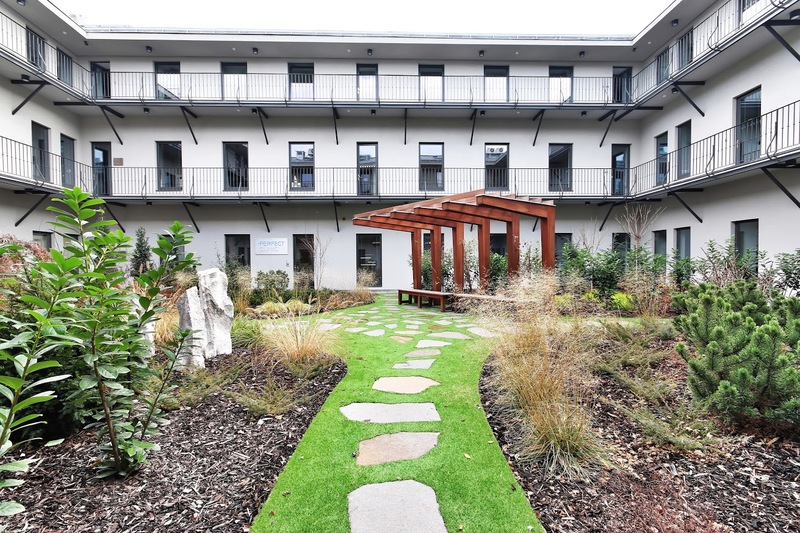 The plan will be created according to the patients’ preferences and financial state so we can meet their needs and no treatments or interventions are neglected. Our priority is prevention. 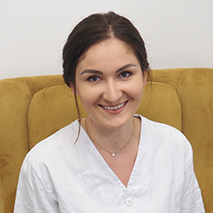 Therefore,we try to treat teeth with maximal care and set a check-up plan and regular visits at the dental hygienist so after the completion of a treatment plan, no further financial investment will be needed and the teeth stay long-term healthy. Dental hygiene is not linked to the treatment of coloured teeth. 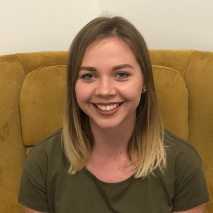 Our dental hygienist advises you how to brush your teeth properly and inform you about parts of a set of teeth that need special or intensive care. 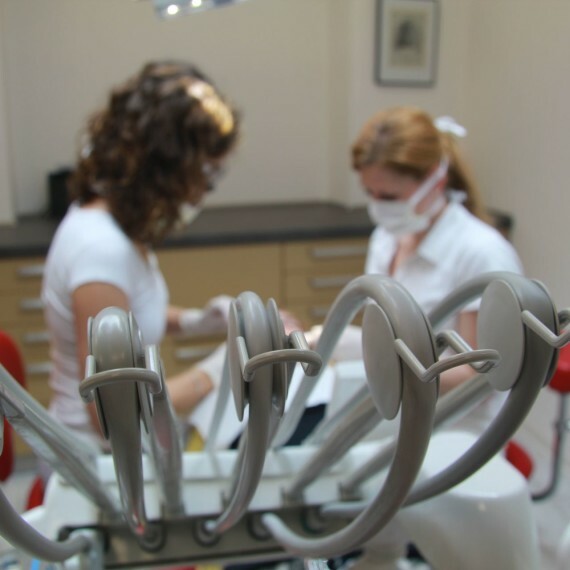 Visiting a dental hygienist is also the first step when you want to have your teeth bleached. Some of the most important factors that affect the health of your teeth and oral cavity are eating habits, drinks, smoking and other habits. 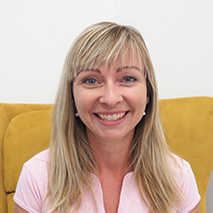 Our dental hygienist will help you choose the right aids, tooth brushes, mouthwashes and toothpastes suitable for your teeth. Air flow is a method focused on how to remove tooth pigmentation using sandblast with a fruit flavour. 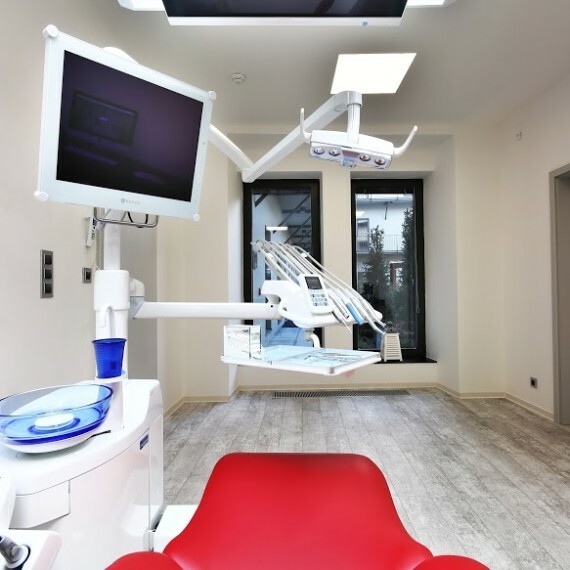 Air flow helps you remove dental plaque, sediment and stals in inaccessible areas. 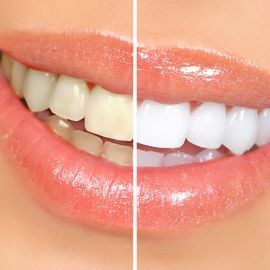 Teeth get a whiter colour and shade. Air flow is a non-invasive gentle method for cleaning pigmentation. Air flow does not have any negative impact on tooth enamel, it is painless and pleasant because of the fruit flavour of the powder. This treatment is a part of dental hygiene. Almost all of us long to have a wonderful shining smile. You can reach it either by prosthetic treatment using crowns or teeth facets, or teeth whitening. 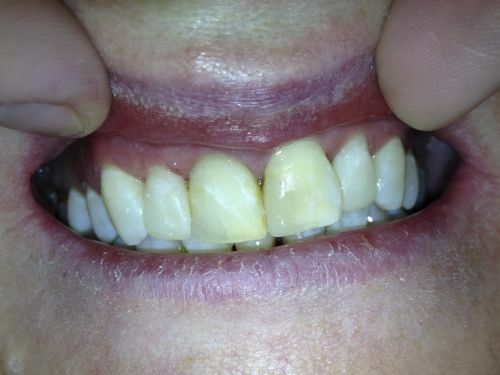 Bleaching has become a common part of stomatological treatments. 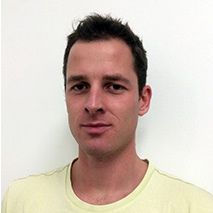 Apart from the health point of view, we also put emphasis on esthetic results. 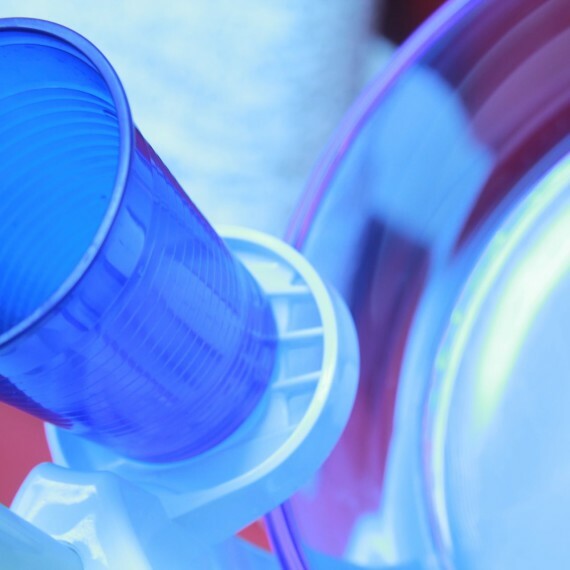 There are two methods of bleaching – surgical and home whitening (using dental carriers). Both methods can be combined depending on the clients‘ needs and possibilities. 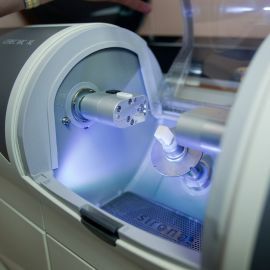 A surgical bleaching is done in a surgery room on a dental chair in one long session. 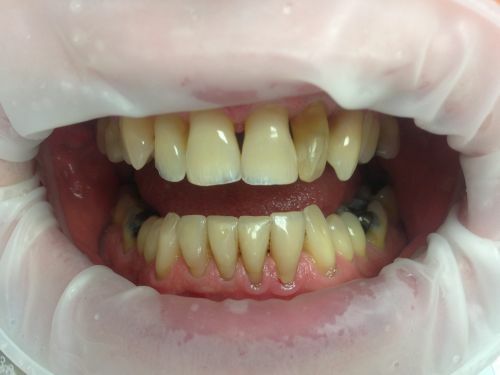 A layer of a concentrated bleaching gel is repeatedly applied on the teeth. 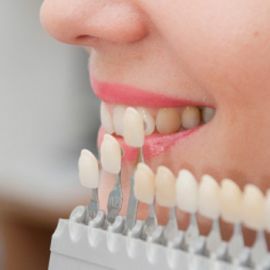 For home bleaching, your dentist will prepare a perfectly fitted dental carrier which will be used with a bleaching gel for 10-14 days (for a couple of hours). One of the advantages is adjusting the process to the client’s own needs and can be repeated anytime. Treatment without any pain is a natural thing at SMILE FACTORY. In case there might be some pain, our dentists use anesthesia. Before using anesthesia, a deadening gel will be applied on the gums which become insensitive, so you will not feel the injection either. 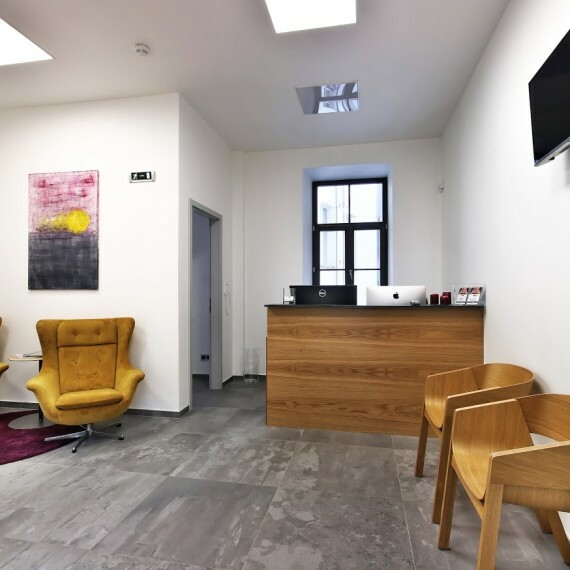 During all treatments, all our dentists make sure everything is alright, that there is no pain and they also inform you about all procedures (in case you will not be watching your favorite channel on the TV above your dental chair). Visit us and experience a painless treatment. At our reception, you can get a free cup of coffee and discuss anything that is not clear. Medical treatment of a tooth decay lies in accurate diagnosis, drilling it off and replacing it with a new material. These materials have to coincide with many properties that are similar to those in natural teeth (for instance, colour, shape, resistence). 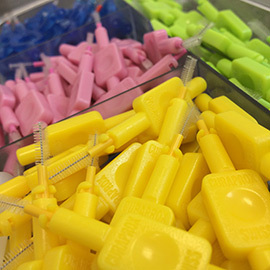 Our dentists use only materials of the highest quality, which are coloured and mixed individually based on patient’s needs. The diagnosis can be determined by a panoramatic OPG X-ray where it shows a complete set of teeth and its condition. Avoiding usage of amalgam or prohibition of using is abroad a reasonable step. The preparation is harmful not only for the patient but also for the dentist and the nurse, who are responsible for the preparation. These harmful effects are caused by mercury vapours with other metallic elements. 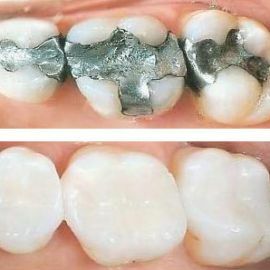 From a long term point of view, an amalgam filling consists of a metallic element with absolutely different thermal expansivity than what your tooth has.This causes microcracks that result in breaking off the tooth. 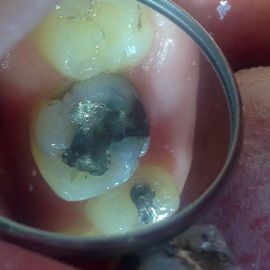 There is also a risk of creating an interstick and decay under the amalgam filling. 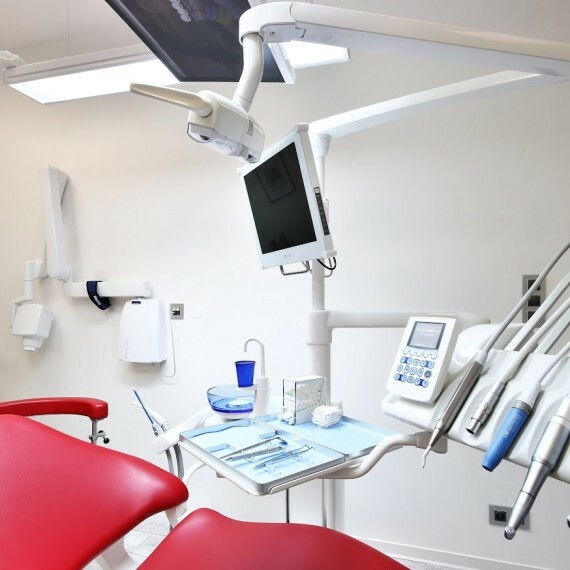 What’s more – to have an amalgam filling done, the dentist needs to drill out bigger amount of the healthy tooth in comparison to the composite fillings. 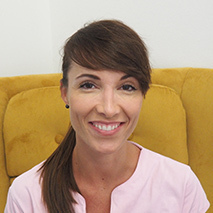 Stomatology is not only concerned with theelimination of decays and treatment itself. 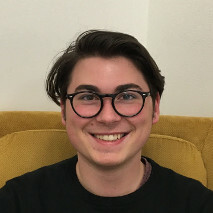 When you smile, you also reveal your teeth and your smile should look beautiful. This is the reason why we put emphasis not only on painless treatment but also on esthetics. 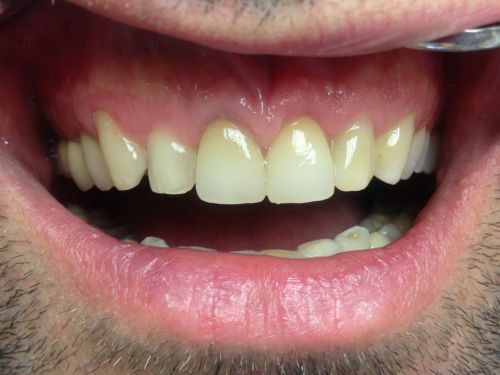 All imperfections can be removed, fillings perfectly fitted and coloured according to your natural teeth. A dentist can be two things – a good doctor, but also a dexterous person with a feel for esthetics. In case you don’t have an ideal shape or colour of your teeth, there is no need for extraction and using implants or crowns. A suitable solution could be pramic facets. These are thin plates which help us adjust either smaller or bigger imperfections. Ceramic facets are used in case a patient wants to change the shape, size or colour of the teeth so that nobody can recognize the teeth are not natural. Facets are usually made for the front teeth which are most visible and create a beautiful smile. Ceramic crowns, inlay and onlays are used mainly when a patient has a decay of bigger size and using an ordinary filling is not possible. In case of a big decay, a tooth loses a lot of tooth tissue, and subsequently, ceramic or metal-ceramic crownshave to be used. 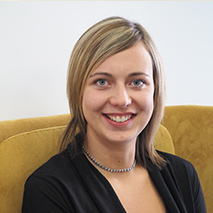 Our dentists will help you choose the right shape to ensure long life and esthetics. Crowns are made in a dental laboratory to guarantee the best quality, shape and colour in harmony with other teeth. If you can’t wait approximately one week to have your crown done, it is possible to receive it the following day using the latest technology CEREC. 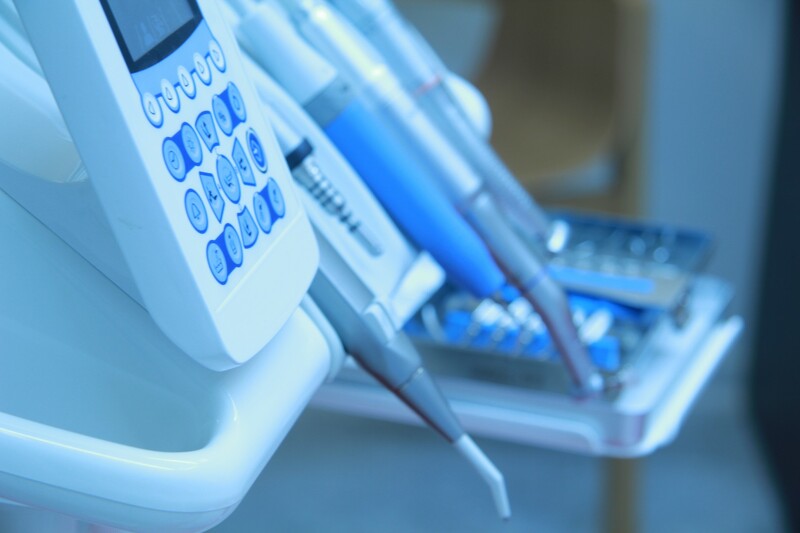 This machine enables us to treat your tooth and replace it by a ceramic crown with the highest quality within just two days. The quality and esthetics remain the same. 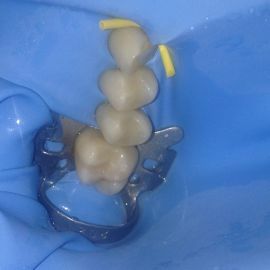 CEREC makes crowns based on the patient’s teeth print. Subsequently, the most suitable colour is added. The final touches are made once the crown is placed. 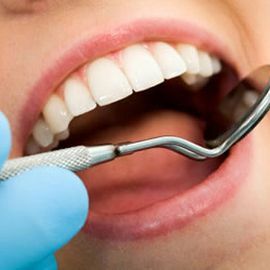 Endodontic treatment is necessary to undergo during the preparations for crowns or having a large decay in tooth pulp. 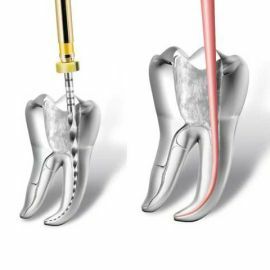 This procedure contains a mechanical and chemical cleaning of root canals and its disinfection. After the complete treatment and disinfection, they will be filled up again and closed. Repeated inflammation is not common. 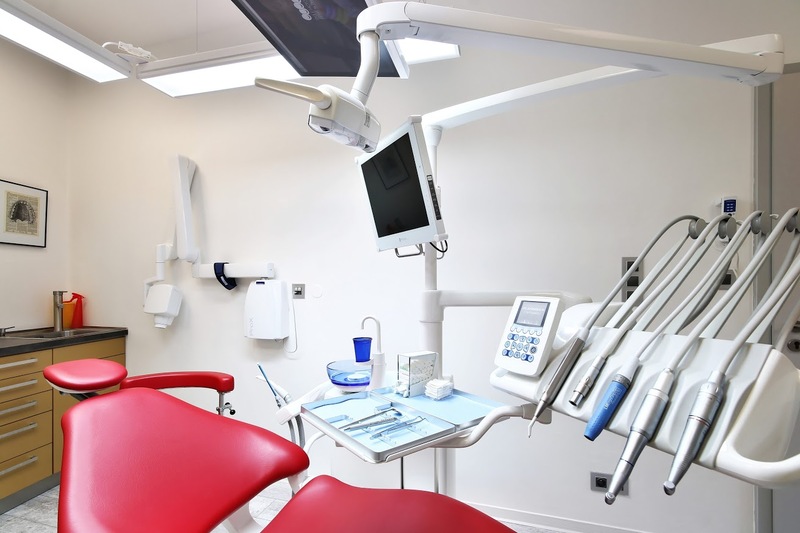 Endodontic treatments prevent tooth extraction, which would have to be replaced by an implant. 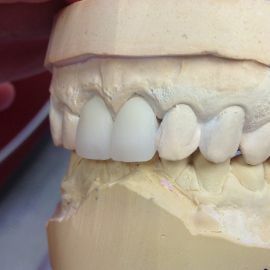 To build up this treated tooth, a white filling or a crown will be applied, depending on the extant. 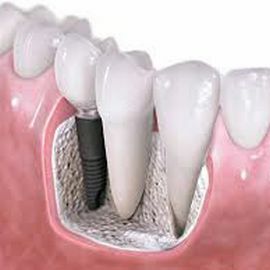 Dental implants are used as a substitution for missing teeth or prosthetic solution of a patient‘s damaged set of teeth. This method uses materials which are not harmful to the patient and do not cause any allergies. Titanium screws are screwed into the jaw. With time, these screws will grow together with the jaw and are accepted. After the implantation, no difference between implants and natural teeth can be observed. 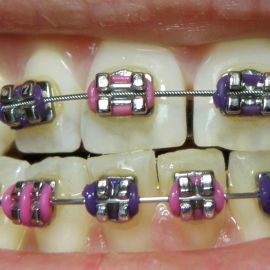 Therefore, this method is preferred to dental bridges. However, dental implants are not suitable for patients with not fully developed jaws. Another possible complication can be a missing bone, nevertheless this can be solved by building up the bone. This field focuses on treatment of periodontium (consisting of gums and bone) - parodontosis, which is caused by bacterias cumulated in plaque. 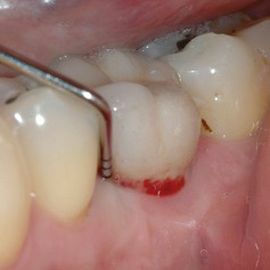 Before parodontosis there is an inflammation of the gum = gingivitis, which you can simply recognize by bleeding gums. However, this can be treated by removing dental plaque and regular dental hygiene. 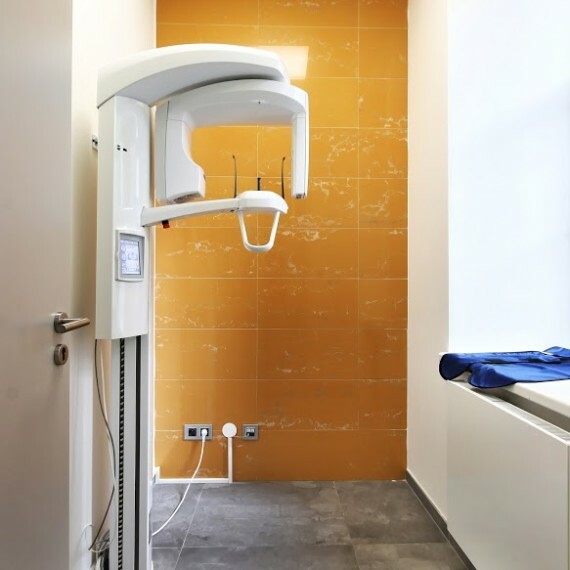 Our X-ray can reveal the first stages, so we can start treating it immediately and avoid tooth extractions. 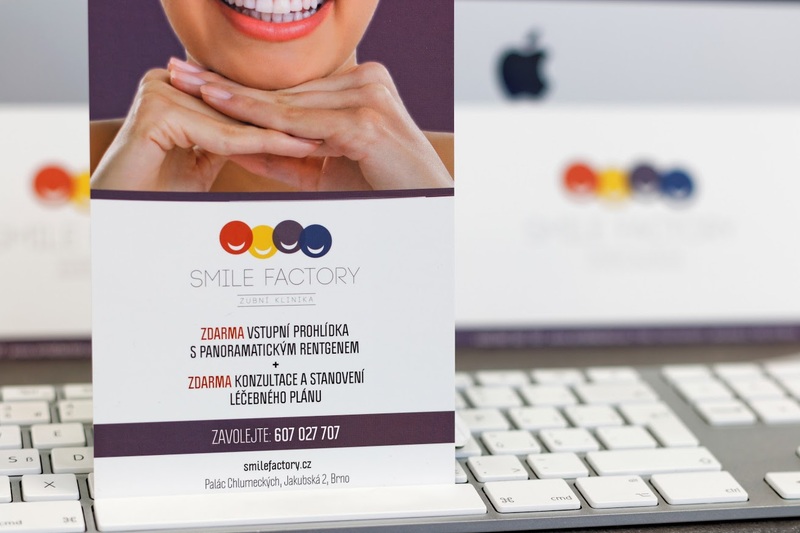 At our dental clinic SMILE FACTORY, we provide complex parodontosis treatment. Conservative parodontosis treatment = hygienic phase, dental plaque removal above and under the gum using machine-ultrasound or curretes. Surgical parodontosis treatment (in case conservative treatment is not efficient) = removal of dental tartar when uncovering soft tissues (sometimes simultaneously adding an artificial bone to the bone defects). 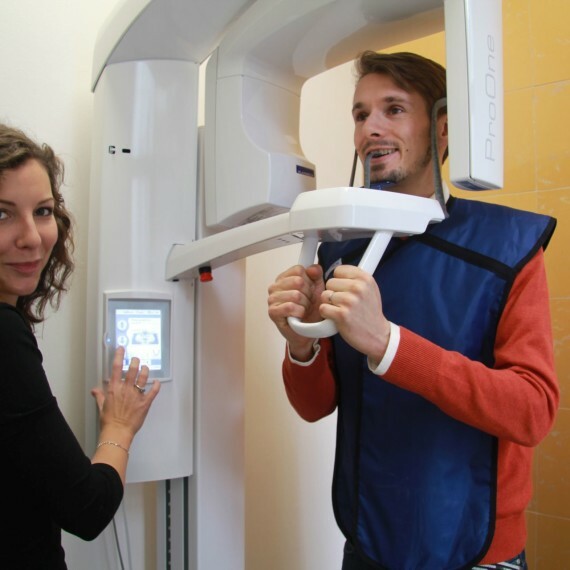 Every patient who visits us receives a complex check-up with panaromatic X-ray OPG. 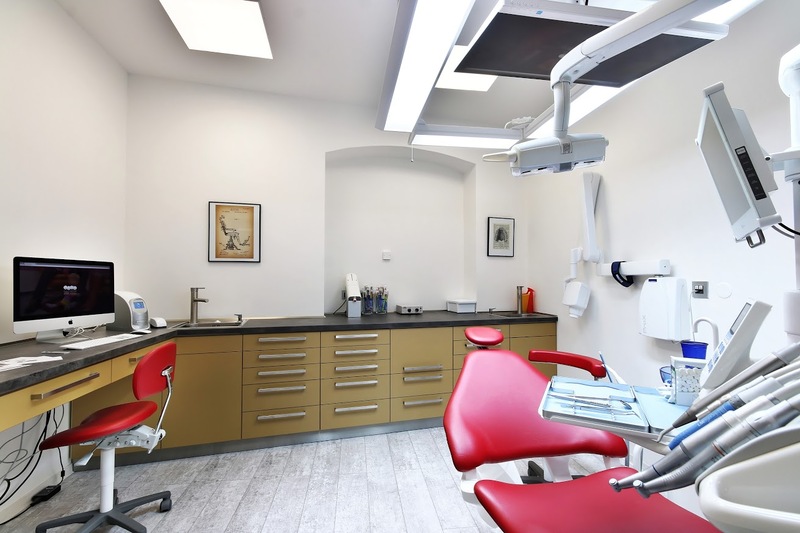 Subsequently, our patients get consultation and suggested treatment plan based on their needs and possibilities. You won‘t have to wait to be treated. All our patients are admitted on time (reservation is needed). Our treatments are painless. During longer treatment, you are offered to watch your favorite series or cartoon. 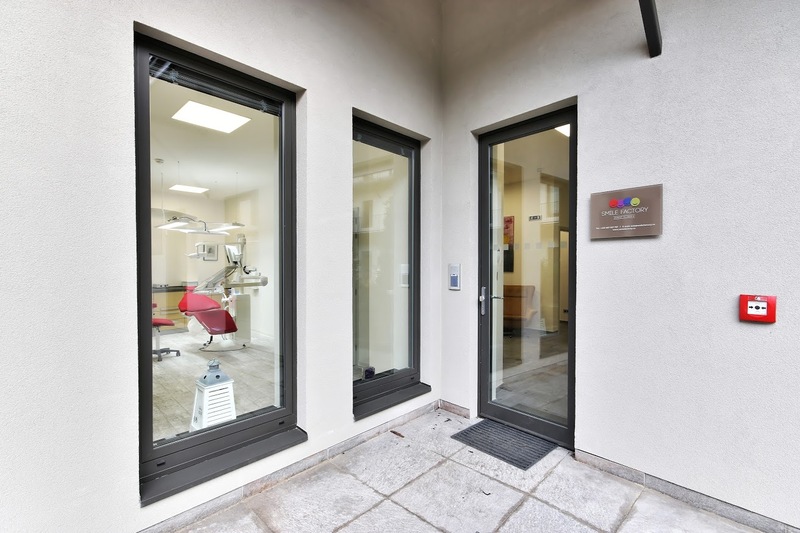 If you are interested in ongoing treatment, our dentist will talk you through the whole procedure. If you come earlier, you can spend your time at our reception with a nice cup of tea or coffee. You can also use aniPad available for all patients and browse the internet or check your emails. The synonym dentine, can be used as well. It is a hard calcified tissue and the biggest part of a tooth, along with enamel, cementum and pulp. 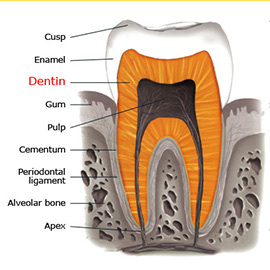 It is usually covered by enamel on the crown and cementum on the root and surrounds the entire pulp. Also know as a dental dam or rubber dam. It is a thin, usually latex rubber used in dentistry to isolate the operative site (one or more teeth) from the rest of the mouth. 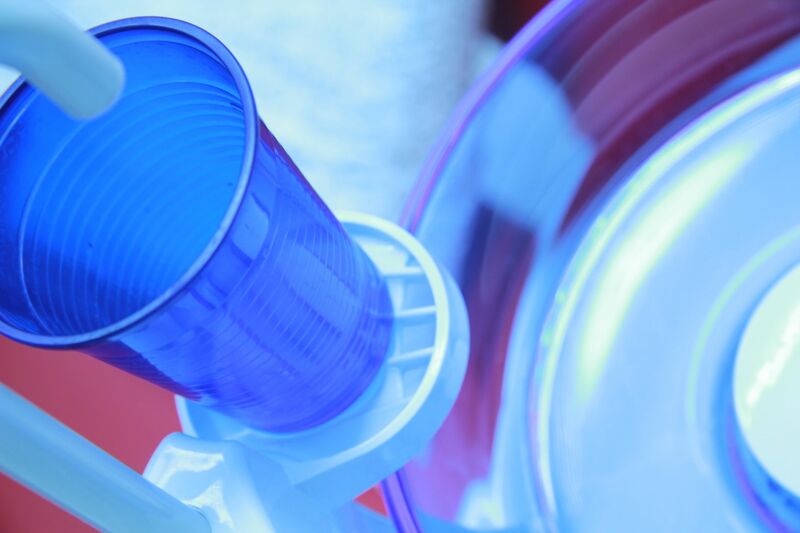 Its purpose is both to prevent saliva interfering with the dental work (e.g. contamination of oral micro-organisms during root canal therapy, or to keep filling materials such as composite dry during placement and curing). It is fixed by a kofferdam clip and a special frame. It is a specialized field of dentistry. 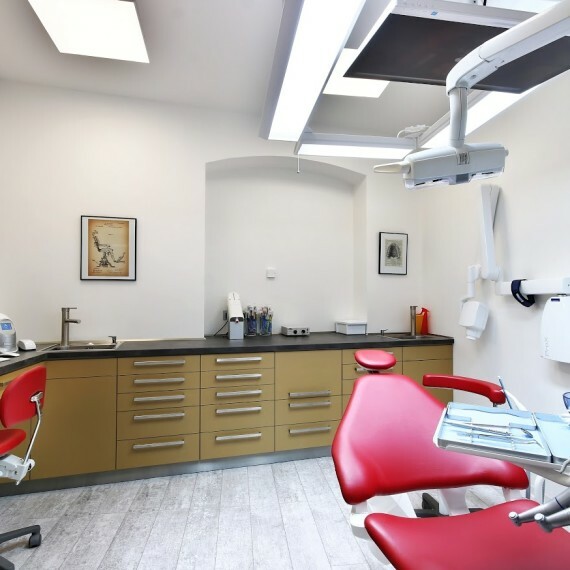 The specialty deals primarily with the diagnosis, prevention and correction of malpositioned teeth and jaws (incorrect number, shape, inclination of tooth or a group of teeth and jaw bones). 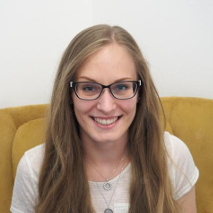 Frequently, an interdisciplinary approach is needed. 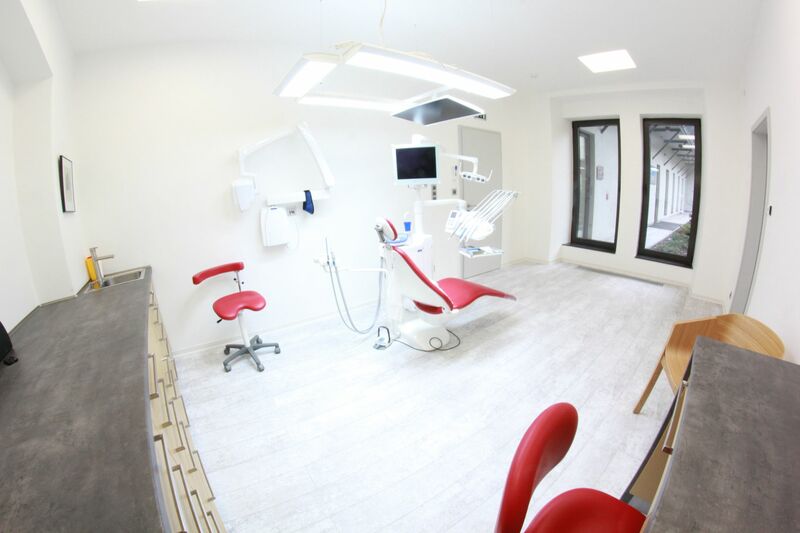 You can find the most up-to-date equipment made by a Finnish producer of equipment for stomatologists at our clinic. Planmeca X-rays and their software provide excellent quality of X-ray pictures. 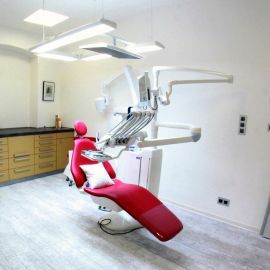 Planmeca dental chairs are very comfortable and its ergonomics enables our dentists to approach their patients better. 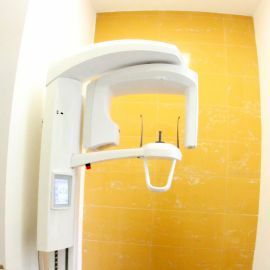 Our dental clinic owns a panoramatic X-ray of a Finnish company Planmeca. 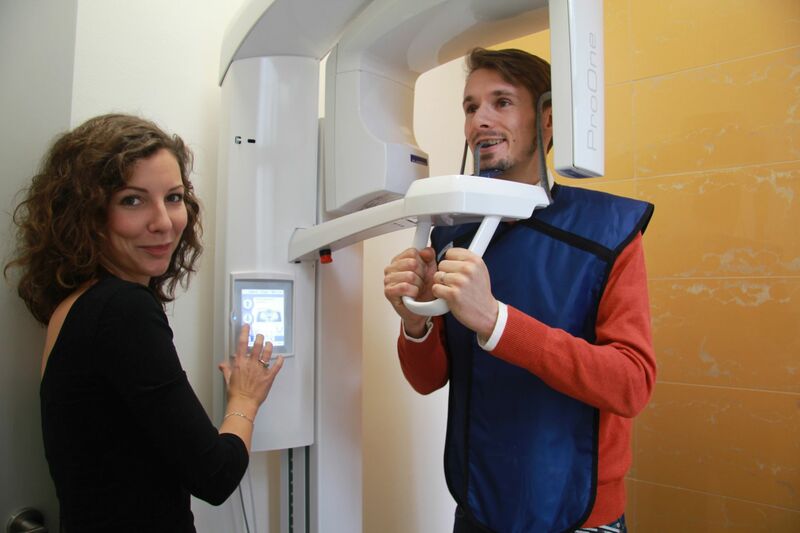 Treatment without OPG X-ray cannot reveal all anomalies in your mouth, interdental decay and other issues. Without this machine, it would make it almost impossible to diagnose our patients‘ health. 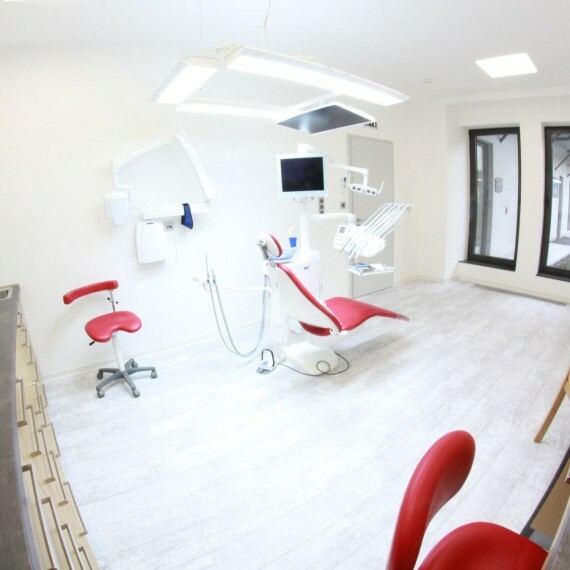 Our dentists work on dental chairs made by Planmeca company, which provide them better access to the patiens, owing to space under the chair. Its simple control and comfortable paddings are beneficial for both the patient and the dentist. 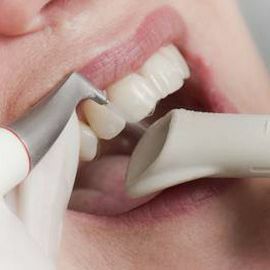 An intraoral X-ray Planmeca serves as a detailed X-ray or a particular part of patient’s mouth. Subsequently, the picture is shown on a foil and afterwards developed via Planmeca ProScanner. 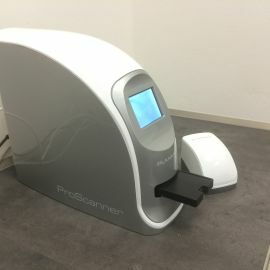 This can transfer patient’s picture via modern software into a PC. 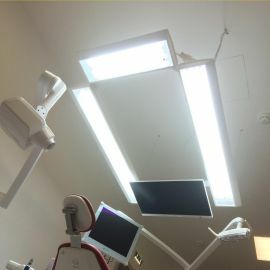 Lightning above a dental chair made by CACAN company provides optimal light for our stomatologists. 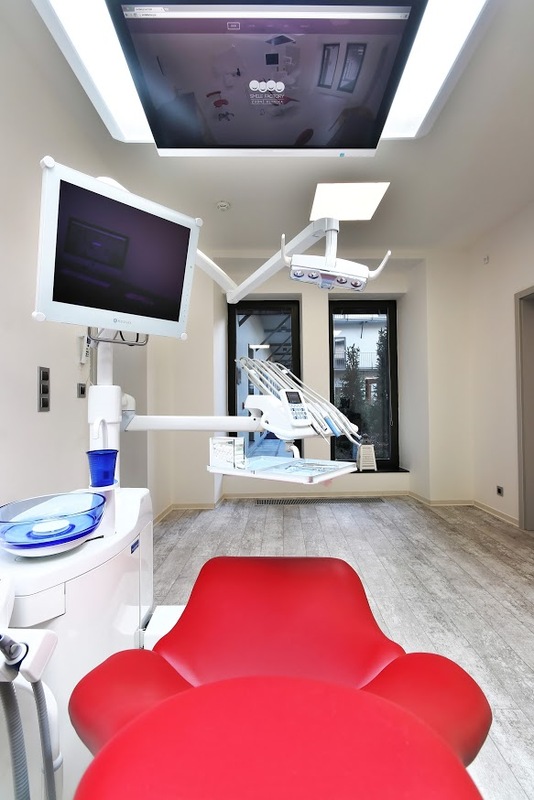 There is also a TV placed on the light, where our patients can watch the whole procedure via intraoral camera. In case the procedure is long, patients can watch their favorite film or series. You can park in parking loft JD Parking near Janackovo divadlo. Leave your contact and we will call you back and agree on an appointment.